You can smell smallpox before you enter the patient's room, but it's hard to describe. Even medical textbooks fall short when it comes to smells. The odor, probably the result of decaying flesh from pustules, is reminiscent of the smell of a dead animal. On at least two occasions, smell alone alerted me to the presence of smallpox. As I walked down a hospital hallway in India, the dead-animal odor stopped me in my tracks; following the smell, I located a smallpox patient. Another time, as I walked down an alley in an urban slum in Pakistan, the same smell hit me. There are competing smells in such places, but again one smell stood out. Knocking on doors, I found two siblings with smallpox. Today, thirty years after the last recorded case of smallpox on the planet, I still find myself contemplating alternative tactics for its eradication, including one using smell. What if back then we'd been able to use trained dogs to identify smallpox patients? This would have sped up the searches in urban alleyways and railway stations, where people often lay on the ground, obscured under blankets. Those of us working in the worldwide smallpox eradication program in the 1960s and 1970s made countless visits to smallpox patients. Most of these visits were to small, crowded, airless, single-room dwellings with the windows covered. In the dark, we were taken to the patient's bed, and it was possible, with a penlight, to examine the lesions and estimate the stage of the disease. Early on, the pocks would be surprisingly hard and deep. As the disease developed, they would fill with pus and soften, becoming pustules. Once the pustules began to break down, the mixture of pus and blood would stain the patient's bed and clothing. The person in the bed might have been happy and productive the previous week, but now had limited prospects of even seeing another day. The disease took each of its hosts by surprise. They were not aware that a virus had entered their body and was silently establishing a beachhead by multiplying in the mindless way that viruses do. The virus carried no ill will; it was simply responding to the drive to perpetuate itself. It cannot reproduce on its own; it has to borrow cells from a human being. The borrowed cells put out ever more viruses, which in turn take over other cells. Having borrowed and destroyed the cells in order to reproduce, the virus shows its gratitude, as it were, by wreaking havoc on its host. After two weeks of multiplication, just when the immune system is organizing a defense, the virus's host for the first time realizes something is wrong-a fever, a headache, perhaps a backache and vomiting. We all experience such symptoms occasionally, so the host doesn't worry. But after another two days, there is no denying the truth. The throat is sore because of lesions on the mucous membranes, and red bumps have appeared on the skin, especially on the face, arms, and legs. Over the next few days, the bumps turn to pustules. A robust immune system and a strong constitution might, at this point, turn the tide against the virus, and the host will recover. Even so, for most survivors, the price is high: pockmarks or even permanent blindness. Many, however, are unable to develop sufficient defenses; they die. We saw some patients who didn't live long enough to develop pustules. The skin became swollen, the fever was high, and the patient became toxic. The virus completely overwhelmed the immune system. The patient began to bleed with a hemorrhagic version of the disease that led, mercifully, to an early death. Once the virus had left the host's body in absolute chaos, it sought out a new host to repeat the process. To me, the process made no sense-what was the purpose? What was the meaning? But the reality of nature seems to be that some species provide no evident benefit to the community of living organisms. While working in the smallpox eradication program, I visited many villages. In one house I might find a baby, face swollen, eyes closed, breathing hard, with exposed surfaces thick with raised, pus-filled blisters. In such cases I would have to admit that there was nothing to be done. The devastated parents were about to lose the child. The next house might reveal two children lying in the same bed. At first glance they might appear well nourished, though sick with smallpox. However, lifting the blanket would reveal that they were very thin and poorly nourished. Their swollen faces, for just a moment, concealed their starvation. In another house a young man might be wearing only a loincloth, because he didn't want anything touching his face or limbs, which were covered with lesions. His legs were bloody. He was trying not to move, grimacing in pain when he did. Any touch caused the lesions to bleed. His face was contorted with pain; he wanted only to die. Each patient was part of a family and a community, yet others could do little to help. There was-and is-no cure for smallpox, and in this sense each patient faced the disease largely unaided. Shift your perspective to a larger scale of place and time, and these individuals become statistics-markers of suffering, but not the real thing. Shift your perspective again and the numbers become changes inflicted on whole cultures, dynasties, and nations, their place in history forever altered by this microscopic organism. Until its eradication, smallpox accompanied humans and human cultures throughout recorded history. Lesions are apparent on Egyptian mummies dating from the second millennium B.C.E. In 1979, Dr. Donald Hopkins-instrumental in smallpox eradication in Sierra Leone and later in India-was allowed to examine the upper half of the mummified remains of Ramses V, who died in 1157 B.C.E. of a disease characterized by a rash. Hopkins concluded that the rash he observed was compatible with a diagnosis of smallpox, although attempts to identify a virus in detached pieces of skin were unsuccessful. Hopkins details how the virus propagated itself in human populations through the centuries following Ramses' time, especially in Asia, Africa, and Europe. It came to the Americas with the European explorers, missionaries, and traders, who reported death rates exceeding 50 percent and as high as 90 percent among some indigenous peoples. In one of the saddest chapters in human history, proud, competent, and powerful groups were destroyed as settlers, carrying the smallpox virus and other diseases, moved into their ancestral homelands. From the Eastern seaboard, settlers carried smallpox with them as they moved westward in the 1830s and 1840s. Smallpox also traveled northward from what is now Mexico. The Blackfoot, once the most feared among Native American tribes, were decimated by smallpox. And the disease had, by 1837, reduced the population of the Mandan Indians to 150. Smallpox played a significant role at key moments in U.S. history as well. In the early battles of the Revolutionary War, American troops were placed at a disadvantage because they, unlike the British, had not been immunized by means of variolation, a prevaccination method then widely practiced in England that uses the smallpox virus itself to immunize. A risky procedure at best, variolation carried much greater risk in low-density populations, where smallpox was a sporadic disease and thus immunity levels in the population were low. The low immunity levels meant that variolation itself could cause widespread outbreaks. During the Battle of Quebec, on December 31, 1775, the Americans outnumbered the British, yet they were unable to sustain their attack because so many were weakened by smallpox. The English prevailed, and Canada remained with England rather than becoming part of the future United States. On February 5, 1777, after more than a year of deliberation, General George Washington gave the order to variolate all American troops. It was a tough decision with high military and medical risks: if the British learned of the program, they could have attacked while the American troops were sick, and the variolation itself, though much safer than smallpox, still destined some troops to die. By the time the British became aware of the operation, however, the two armies' susceptibility to smallpox was close to equivalent. Variolating the troops may have been Washington's most important tactical decision in the pursuit of independence. Nearly a century later, smallpox would come close to impacting what some historians have described as a watershed moment in U.S. history, when "the United States" shifted from a plural noun to a singular noun: Abraham Lincoln's delivery of the Gettysburg Address on November 19, 1863. Reporters at the time described President Lincoln as appearing "sad, mournful, almost haggard." When he left that night for Washington, he had a severe headache and was forced to lie down, and for the next two weeks he was confined. His doctor originally diagnosed the illness as "bilious fever," and when a rash appeared, he called it scarlatina. A consultant, Dr. van Bibber, was called in to examine Lincoln, and he diagnosed the president's condition as smallpox. How Lincoln contracted the disease is unclear, but it might have happened while he was visiting hospitalized Union Army troops in Washington two weeks earlier. Had his incubation period been only one day shorter, the Gettysburg Address might not have happened. The clinical picture has varied through history and across geography in part because of differences in the strains of smallpox: the highest consistent death rates occurred in Asia (30 to 40 percent), intermediate death rates in West and Central Africa (20 to 30 percent), and the lowest in South America and certain parts of East Africa, where deaths were rare. High death rates among populations where the virus had only recently been introduced, as cited earlier for the Americas, usually resulted from the population's not having had a chance to develop resistance over the centuries. Yet that may be only part of the reason, since even in Southeast Asia, despite many centuries of exposure, smallpox still killed about one-third of those who became sick. So virus type also had a strong influence on mortality. Personal characteristics, including nutrition and variations in immune systems, may also have contributed to how different individuals reacted to the same virus. Population density had an indirect influence on mortality by affecting the age groups attacked. In low-density populations, occurrences tended to be sporadic and to affect all age groups when the virus was introduced, whereas in high-density populations, the disease was more a disease of childhood and young adulthood. In general, death rates are higher in the very young and the very old; therefore, changes in the ages of cases can change the mortality results. The dream of eradicating smallpox had its beginning on May 14, 1796, when Edward Jenner, a physician practicing in Berkeley, England, inoculated cowpox taken from the hand of Sara Nelmes, a milkmaid, into the arm of a young boy named James Phipps. Jenner's experiment was grounded in his keen observational abilities and unusual patience. He was aware that poets described the complexions of milkmaids as lovely, and at the urging of his mentor, John Hunter, he applied himself to the question of why that would be true. Milkmaids, he observed, rarely had smallpox scars. Indeed, he had heard a milkmaid claim that she was protected from smallpox because she had previously had cowpox. He became convinced that the milkmaids' smallpox protection resulted directly from the cowpox sores on their hands, acquired from sores on cows' udders. Cowpox, unlike smallpox, was a self-limiting event and of little consequence. Jenner, like other scientists of that time, lacked any understanding of viruses, immunology, vaccines, or vaccinology. He thought of the use of cowpox to protect people from smallpox in terms of mimicking nature. After twelve years of careful observation and note-taking, Jenner performed his experiment on the young James Phipps. A few days later, Phipps developed a sore at the site where cowpox had been inserted. After a few weeks, Jenner exposed the boy to smallpox by inoculating him with material collected from the lesions of a smallpox patient, using the method of variolation. The boy remained healthy, confirming what Jenner suspected: cowpox somehow provided protection against subsequent exposure to smallpox. In 1798, Jenner published an account of his experiment, a publication that has become a classic in the public health literature. By attempting to copy nature, Jenner discovered the basic principle of vaccination. It is possible, using something similar to a deadly virus but itself innocuous, to fool a person's immune system into developing antibodies that destroy both viruses on contact. Over the years, scientists have made many vaccines by altering a virus that usually causes a disease. Vaccinologists have also learned how to modify the toxins caused by some organisms, such as the tetanus toxin, so that antibodies destroy the toxin itself. More recently, scientists have been working on vaccines against bacteria and, even more astounding, against parasites such as malaria. And viruses (with the exception of influenza) do not become immune to vaccines, as they do to antibiotics, so vaccines often provide lifelong protection. Jenner's discovery of this tool for preventing disease is one of the great breakthroughs in science. Indeed, the modern era of public health can be traced to Jenner's 1796 experiment. Jenner saw the possibilities of his discovery and began to supply vaccine and instructions to interested persons. Thomas Jefferson, ever the scientist, also saw the potential and by 1801 had acquired vaccine from a medical friend in Boston. Jefferson personally administered the vaccine to his own household and to neighboring households around Monticello. Aware that Native Americans suffered from high smallpox death rates, he provided Meriwether Lewis and William Clark with vaccine to protect the tribes they met on their expedition across the continent between 1804 and 1806. This idea was better in theory than in practice, since they lacked a way of keeping the vaccine viable for long periods. In a letter to Jenner in 1806, Jefferson envisioned the eradication of smallpox: "Future nations will know by history only that the loathsome smallpox has existed." Sadly, despite the fear of smallpox and the availability of a preventive vaccine, effective vaccination programs were slow in coming and smallpox continued to be a scourge to the world. It was not until the middle of the twentieth century that the world began to fulfill the promise of Jenner's discovery and Thomas Jefferson's prediction. 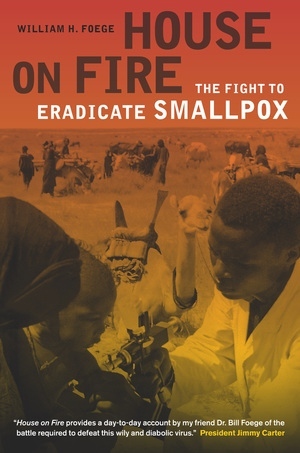 In 1958, the World Health Assembly (WHA), the governing body of the World Health Organization (WHO), passed a resolution to eradicate smallpox globally, and finally, in 1966, the WHA ratified a plan and a budget to support a global smallpox eradication program. There are several reasons why the world had to wait 170 years after Jenner's work for smallpox to be eradicated. First, it was not until the 1960s that a vaccine was developed that could be produced in the countries where smallpox was endemic. Second, better vaccination techniques were developed, specifically, the jet injector, which was used in Africa and elsewhere around the world, and the bifurcated needle, which was tested in field trials and used widely, especially in India and Bangladesh. Third, the new world order that emerged after World War II, including the development of the United Nations and WHO, made a global initiative possible. Fourth, enough people believed that eradication was possible. It took a new passion to proclaim that a disease that had plagued humanity for so long was not a fixed entity in the human landscape. Finally, there was a crucial shift in vaccination strategy, from mass vaccination as the primary strategy to a highly focused form of surveillance and containment that turned out to be ideal for interrupting the progress of the smallpox virus. Surveillance and containment was envisioned from the beginning as the logical next step after mass vaccination had reduced the level of smallpox transmission; but it was found that surveillance and containment could be used as the primary strategy, speeding up the eradication effort. It was applied first in Nigeria in 1966 and 1976, then in other parts of West and Central Africa, and eventually elsewhere. It was refined six years later in the most intense smallpox area of the world: Bangladesh and the northern Indian states of Uttar Pradesh and Bihar. The chapters that follow track the story of this development. William H. Foege, Senior Fellow at the Gates Foundation, has held a succession of distinguished positions, including Director of the Centers for Disease Control and Prevention and Professor and Health Policy Fellow at Emory University. Before becoming director of the CDC, he was chief of its Smallpox Eradication Program. Foege is the author of Global Health Leadership and Management.